I found this fix on Laravel News, if you haven’t been there… leave this site and go there now, and just wanted to record it in a way that was easy for me to access. I’ve Googled this thing 3 times this week. In trying to build a very small micro-service I decided to use client credential grant tokens. I didn’t need users or personal tokens. I just needed one of my other sites to be able to access data for this new micro-service. According to Taylor, “The client credentials grant is suitable for machine-to-machine authentication” which sounds just great. So I set off to build the entire service using TDD with Passport::actingAs() to mimic authorization knowing I’d do a final external test once it all was working. All is working great and my tests are passing with my testing database. So, I run migrations on my real database, create my passport client with “php artisan passport:client,” give it a user id of 1, “ApiAccess” for the name for funsies, and keep the default for the redirect. This gives me a Client ID and Client secret. I head over to Postman, pop those in, send a post and get my access token. After a 2ish hours, I figured out how to implement it without making a mess. These instructions assume you know what Client Credential Grant Tokens are for (read the above link about “machine-to-machine”) and why you might use them. 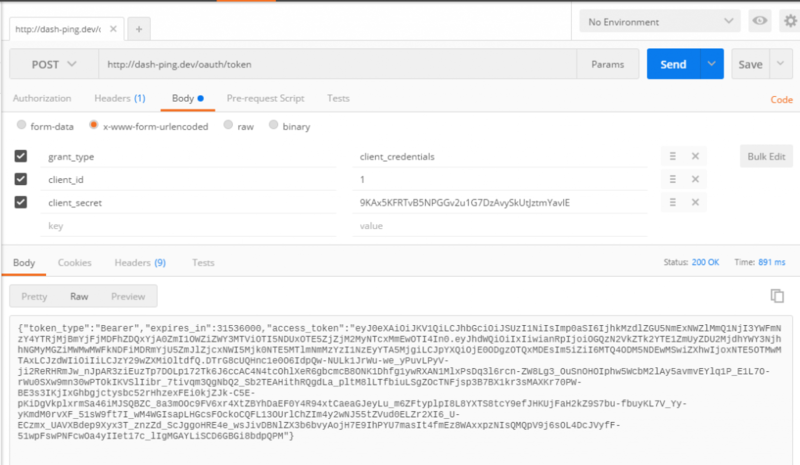 Also it doesn’t address a funky token expiration issue that some found in postman. This, it turned out, didn’t affect me but did lead me on a wild goose chase for a bit. This will allow us to separate these routes so we don’t affect any other necessary API routing in the future. Here I created a new middleware group for client_credentials (“client_credentials” is the string we used in RouteServiceProvider.php for our new middleware). This file has been abbreviated to show only the updated info. That is the %$%$@ middleware to check the client credentials that is no where to be found in the documentation. It worked! Yay! Hopefully if you’re banging your head against a keyboard right now trying to figure this out, like I was, this article will help. I pulled ideas from this posts but the implementation was a bit awkward. One the receiving end, you’ll be able to access your info from $_POST. If you found this, you were probably fruitlessly searching the web for the answer just like me. I hope this helps.